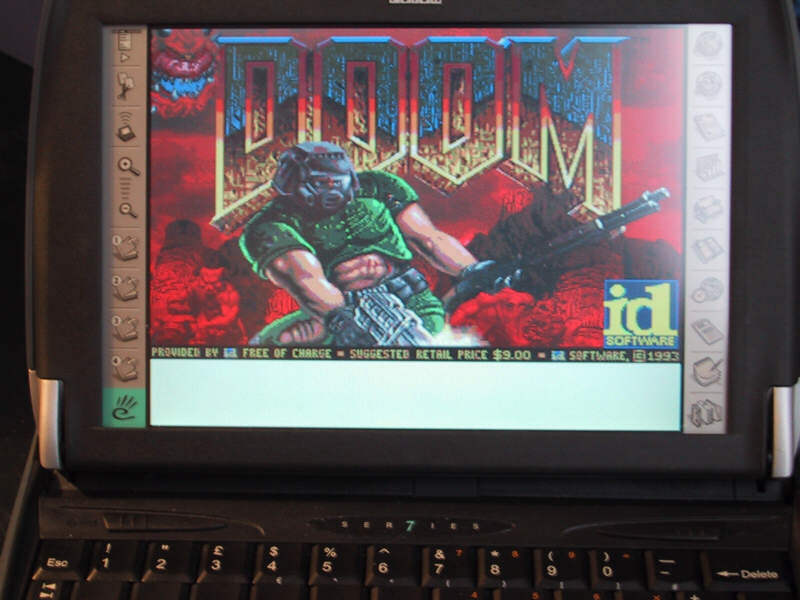 EDoom is a port of Doom legacy for the Psion Series 7, which runs on Psion's EPOC OS . Sound doesn't work, but apart from that it's fully functional (I think), running at 640x400. I have no intention to work any further on the port but at least you can enjoy what there is so far. Maybe some other brave soul will complete it someday (long live open source!). I do not actively support EDoom, so please don't bother sending bug reports. Unzip edoom.zip file onto your Series 7 on either c: or d:, honoring the directory structure (edoom.exe may be stored anywhere on the device). You need doom1.wad and doom3.wad, both need to be stored in the same directory as edoom.exe. Doom3.wad can be found as part of the win32 doom legacy distribution. See the doom legacy website for more info. Click on edoom.exe and enjoy the fun! Latest sources are released under the GNU General Public License. The same disclaimer as for EGnuBoy applies (about the cleanup). EDoom splash screen on the Series 7.